I am in getting ready to replace the a/c compressor and need to figure out if I have r-12 or r-134. Is there a way to figure it out? What would be the year model of this car? 134 has different fittings to add freon. The hose to add r12 wont connect to a 134 system. And yes, what type and year of car do you have? 66 Pontiac or 2001 Rolls Royce. 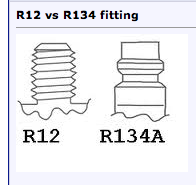 I've got R134 fittings and yet it's filled with R12. 1970 Mercedes 250c, 1976 International Scout II, 1982 Mercedes 240d, 1997 Honda Accord Wagon, 1998 Acura Integra Type-R, 2009 Mazda5. 1974 International 100 pickup, 1975 International Scout II, 1981 Mercedes 240d, 1985 Mercedes 300SD, 1988 Honda Accord, 1988 Ford Thunderbird, 1991 Honda Accord, 1996 Geo Metro, 1996 Ford F150, 1996 Dodge Grand Caravan, 1997 Honda Accord, 2003 Acura TL-S, 2003 Yamaha V-star. a refrigeration analysis is the only way to be SURE, but if you have 134 stickers on the car, and you have 134 fittings on the car, it's a good guess that 134 is in there. if you have the original 1/4" flare fittings on the car, it's a good bet that 12 is still in there. On my CD the lower one was not changed. My wagon came to me with one of each type fittings.I Called every so called A/C shop within 50 miles and none had the ability to identify the refrigerant ! Most were not even aware that there was such a tester. Called an old friend who did alot of A/C work, he said put in "Freeze12"which i did and it has been working very well for over a year.He said it is compatable with both gasses and either type of oil.Not suggesting that you do the same but it worked for me. FLAME SHIELD ENABLED!!! That's probably because the guy did the conversion himself and just put the adapter on the low pressure side. If you have a R-134a on your low pressure side I'd bet that's what's in there. I'm fairly certain the new stuff is in there, that lower line is quite costly. nahh, call phil, he's got GREAT prices on the lines! I don't believe he is referring to his refrigerant line needing to be changed but that the R-134a adapter has been put on the low pressure side but not on the high pressure side. It was r12 in the system, went back and looked at the records when the a/c system was redone. I disconnected the compressor and there was no freon in it, which must be the reason the compressor froze up. At first I thought it was just the clutch that went out, but the compressor when turned manually grinds. The o-ring on the back had a big gouge, so I assume that is where the leak was. Need to put a vacuum on it once I get the new compressor installed. I am thinking the freon as well as oil leaked out and caused the clutch to fail. Any thoughts? Sounds likely. Oil gone probably caused compressor failure which in turn caused clutch to fail. But now, the point is, unfortunately, moot. The ONLY way to know for sure is with the use of a Refrigerant Identifier. Most anyone who does any volume of auto refrigeration work will have one. Fittiings installed mean nothing, in spite of the fact that Federal Law requires that the appropriate fitting for the refrigerant used be present. Too many rogue conversions out there for this to be reliable. Call your local shop and ask if they have a Refrigerant Identifier.